- After a good nights sleep I felt refreshed and strong and got an early start to beat the heat to tackle all four of the Seward Range peaks. - On Trail 6am, Donaldson 8:25am, Emmons 8:55am, Seward 10:05am, Seymour 12:25pm, finished 3:25pm. Temps where in the 80's, hot and humid, hazy views, wind was picking up in the afternoon up to 25 mph gusts above 4,000 feet. - The Seward Range is usually done in two separate hikes, hitting the three peaks of Donaldson, Emmons, and Sward all along a ridge in one day and then Seymour by itself on another day, but I decided it would be a pretty challenging hike to knock off all four in a day. I decided to head up to do the three peaks first and drop down, head over, and up and down the steep ascent up Seymour last. - The hike to the Calkins Brook herd path was very easy over old truck roads. 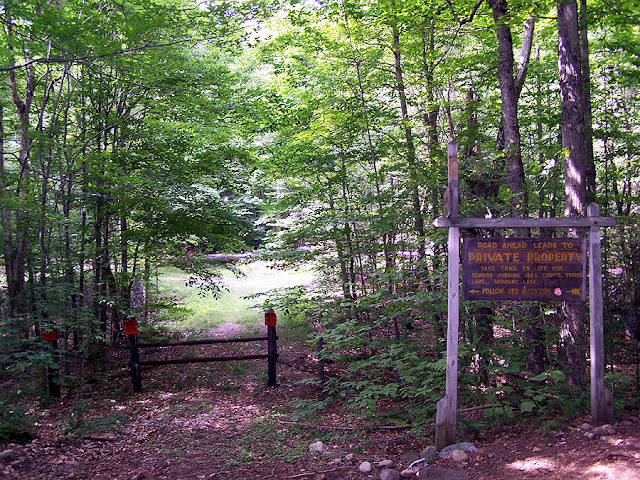 The start of the heard path is marked by a cairn with and old rusted bucket on top of it. - The herd path was easy to follow and was never steep as it gains the ridge just below the summit of Donaldson Mountain where there are terrific views. - The hike over and back to Emmons is in the woods and other than a few minor mud pits is easy going, there are limited views from the summit of Emmons where I didn't spend much time and quickly headed back to Donaldson and took a break before heading to Seward. - I was surprised that the herd path to the peak of Seward didn't go along the ridge the whole way, it drops down a little before climbing steeply back up to the ridge a few tenths of a mile from the summit. This steep climb up was the highlight of the hike up into a gully with some ledges providing excellent views back to Donaldson and Emmons. 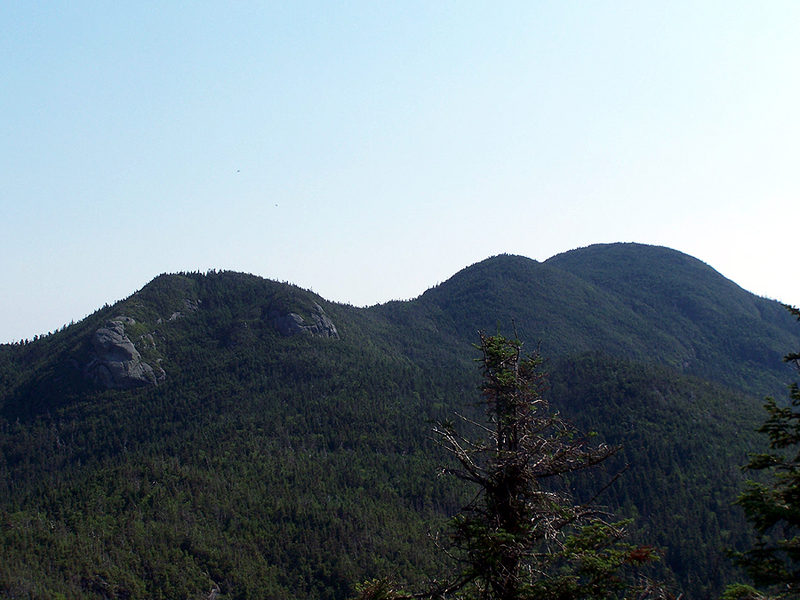 - I was hoping for a nice outlook from the summit of Seward but it was in the trees so I refueled and headed down the steep and eroded herd path to the Ward Brook Trail. 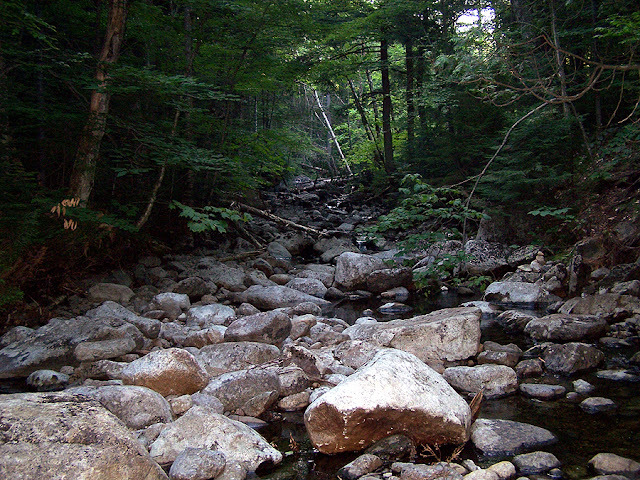 I actually enjoyed this trail, it has went rock slabs, rough rocks, mud, then levels off and follows the picturesque brook for the last part over soft level footing with just a couple mud spots in places until reaching the Ward Brook Truck Trail. 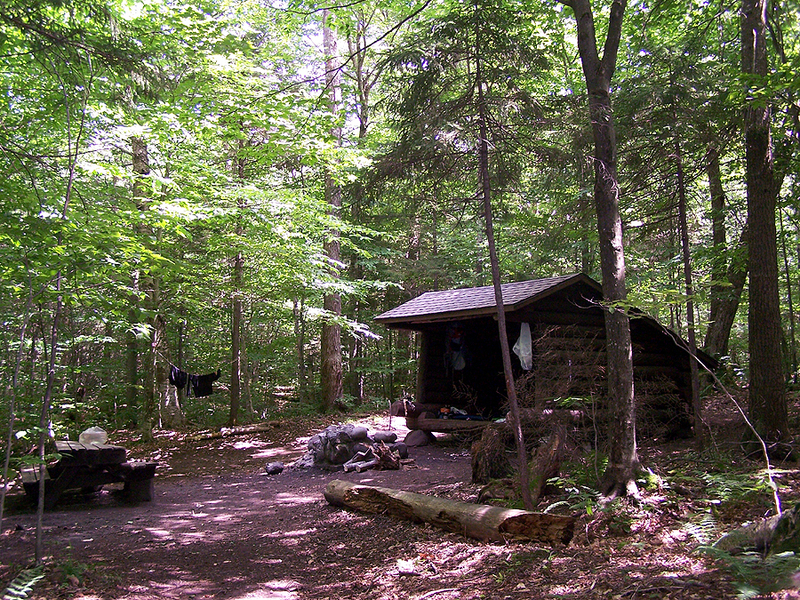 - Now it was off past the Ward Brook Lean-to to the herd path up to Seymour. The herd path was easy to spot, about a tenth of a mile past the lean-to marked by a small cairn. - The path up to Seymour is steep, a few tenths of a miles in the path parallels a slide for awhile. I was really bummed the herd path didn't go strait up the slide, I would have liked that (I think at one time it did). Once past the slide I finally "bonked" out and hit a wall a few tenths of a mile from the summit. I knew I was close but it was so friggan hot and humid. I just kept chugging water and chugging my way to the summit where it became very breezy so then I took a break on the ledgey outlook just below the true summit. - After relaxing for a half hour enjoying the breeze, views, and my lunch it was time for the long descent back to the car. The hike back to the Ward Brook Truck trail went quickly, the hike back to the car was not as fun as once again I had an annoying fly buzzing around my head for most of the final five miles along the mostly flat trail. - I ran into a group of eight heading into the lean-to's along the way, about two dozen toads hopping along the trail, and well over one hundred "Posted" private property signs every couple of hundred feet nailed to trees right off the trail. - Back at the car I changed up and drank up all the fluids I could find before checking the weather report to see if Monday's forecast was promising, unfortunately it wasn't so I decided to head back to RI. - This ended a great two day adventure in the Adirondack High Peaks, I'm getting closer to finishing the "Forty-Sixers." So far it has been fun, I really like the area alot, the trails are pretty wild and rugged and I will never ever complain again about the trail conditions in the White Mountains...trust me you've never seen mud like this! The Following is being posted for the guy below who called me a liar about my times since I do not use a GPS. The images are of the Seward Summit disk and the outlook near the Seymour summit. 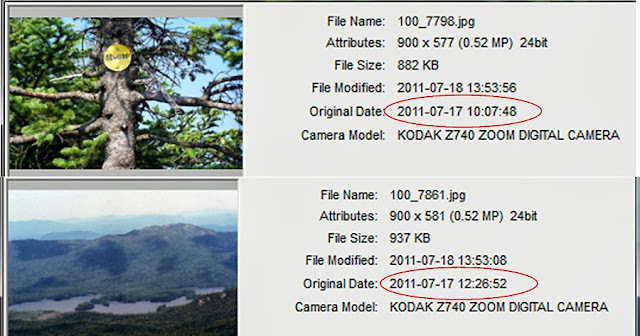 The image above shows a screen shot of my camera info off my computer screen and the images below I added the time stamps using Fast Stone Image Viewer. Awesome pictures! Do you have any suggestions for footwear for hiking here? You mention mud worse than the White Mountains, potentially too much for average hiking boots? Also, are the bugs bad enough to carry an insect repellent? Glad you like the pics, thank you! As for the mud, you don't need any special hiking boots. Actually since I was there in June the mud has improved significiantly but there's still spots here and there where you have to watch your step or "PLOP" your going boot to shin deep! The bugs have never really bothered me other than in the afternoon walking on the old roads / private roads when one annoying fly buzzes around my head. I do carry bug spray for mosquitos which are usually out in the early morning. Have a great time hiking! Thanks for all of the great trip reports, they have helped me a lot in planning my hikes. I'm curious, how do you track your mileage and elevation gains? I'm assuming you use a GPS, if so what is your preferred GPS? Hi Doug, Glad you like the trip reports, thanks! As for finding out milage and elevation gain I do not have a GPS. 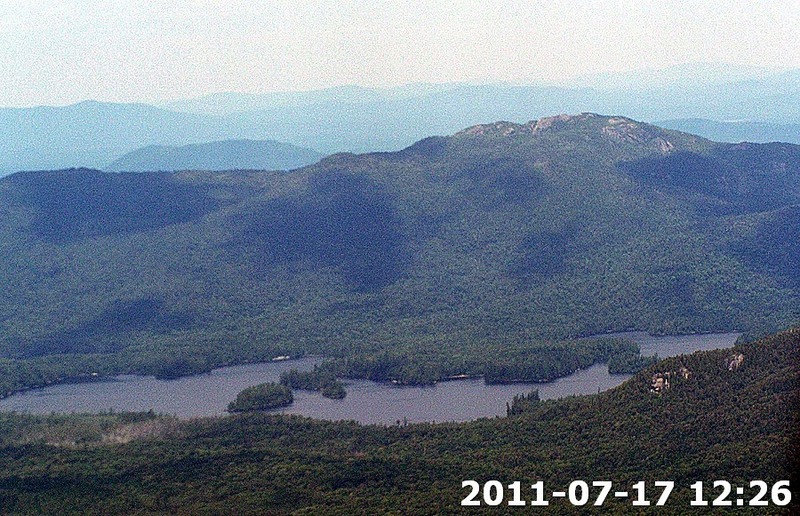 I basically use three things to figure it out, The High Peaks guide book, the maps, and this website http://alavigne.net/Outdoors/FeatureReports/Adirondacks/index.jsp?navpage=peaklist which has trip reports with a gps that show milage and elevation. So my milage and elevation gain aren't extremely accurate but close enough. your times are ridiculous, can you prove them with a gps? Hi Anonymous, I do not have a GPS. I hope your comment isn't questioning the validity of my times, they're all accurate. Next time leave your name or email me. My name is Joe Bruni, I live in Lake Placid and hike/ski extensively in the high peaks. I don't subscribe to the options listed hence anonymous showed up, should have signed my name so I apologize for being rude.....I take it from your answer that you don't have GPS to back up your times, so yes, I doubt your stated time between summit of Seward to summit of Seymour in 2 hours 20 minutes. That's a speed of 2.6 miles/hour over 6 miles of continuously very steep eroded rough muddy terrain, with ankle grabbing roots and ledges without ladders that must be negotiated (especially on the route down seward) with only the short flat part at the bottom. You admit that you basically bonked going up Seymour and had to stop frequently and ended up resting just under the summit, which makes your time all that more unbelievable. The reason for my comment is I'd really hate for a hiker unfamiliar with the high peaks to happen upon your site and plan a hike base on your stated times as they are ridiculous and you can't back them up with anything more than "I hope your comment isn't questioning....." That's how I happened upon your website...a friend's niece was planning a hike and ran her itinerary by me. Serious speed hikers like Ben Nephew and Jan Wellford use GPS, because it proves what they've done and how good they are. Sorry this isn't a "way to go man" comment, but this is the comment section, not the back slapping section and I'm choosing to doubt you. Put it this way Chris...the total mileage for your hike is roughly 20.5 miles by national geographic maps. you hiked that in a stated time of 9 hours 25 minutes which is an average of 2.17 miles per hour for the whole hike. There is little chance that you hiked the most difficult part of the hike faster (2.6 mph calculated above) than your overall time. your overall time includes the 9 miles of completely flat truck trails. something doesn't add up with your numbers. maybe check your diary again to see if you copied something incorrectly. Sorry you don't believe me but I didn't fudge any numbers. If this was the case it means I have lied about all my long solo hikes. To correct you I never "had to stop frequently"...I bonked but kept on "Chugging water and Chugging water to the summit" THEN I headed to the nice outlook and enjoyed the breeze before descending. Actually, I was wrong, it took 2 hours and 19 minutes to get from Seward, so I cheated myself out of a minutes, oh the horror!!! I just checked the time stamps on the photos on my hard drive and found that out. Also, I am not a true trail runner, I have never gone for a FKT so unlike Jan and Ben I don't see the need to time my hikes with a GPS. But you can believe what you want. Have a great autumn hiking! One more incorrect statement on your part. It's only 4.5 miles from Seward summit to Seymour, not 6 miles. 2.5 down to the truck trail, .7 to the Seymour path, and 1.25 to the top. You were including the descent in your calculations for the Seymour path. It's only 1.25 to the summit, 2.5 miles is the up and down. Joe, what are you talking about? 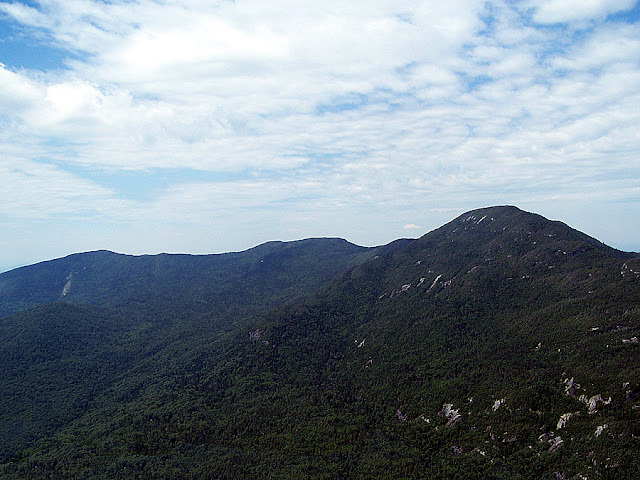 From Seward summit to the Ward Brook Truck Trail is 2.5 miles, from there to the cairn for the herd path up Seymour is around 0.7 miles and the path to the summit of Seymour is about 1.3 miles at the most. Meaning Chris went 4.5 miles in 2 hours and 20 minutes. You screwed up your calculations and took it out on Chris. I find this funny as Chris could probably go do this hike again in 7 if he felt like it. He was actually going slow that day and taking his time. You need to get a life! Chris, my comments aren't posted to start an argument or be confrontational but rather to cast doubt on your times for the benefit of anyone else reading your blog. intelligent people can make up their own minds. your distances are wrong and no one hikes faster uphill than on the flats, no one. Once again I am sorry to hear this and I am now finding your comments disrespectful. It does not seem like you read both my replies, I have the time stamps on the images that can prove where I was if need be. Also, Nowhere did I say I hike faster uphill than I do on flats so you are putting words in my mouth that I never said for the second time just like when you said I made frequent stops, which I never said I did. Once again my blog is not to be used for 'Book Time' how else can I make this point clear. I will repeat, "Everyone hikes and enjoys the trails at a different pace" so no one should use anything other than a guide book for a time reference, and everyone who has read a few of my posts knows this. I have been writing about my hikes for five years because I love the outdoors and am retracing the footsteps of my parents who are unable to hike because of injury and illness which is clearly posted in my bio through a link on the top right of every page. I find it appalling that I have to defend myself on my blog about something which it isn't about. Joe, my name is Eva Mendoza and I am a friend of Chris's. I am a personal trainer in Pompano Beach Florida. I have had the privilege of running Chris through a boot camp with professional and Olympic hopeful athletes. Chris is not making his times up. He has pretty remarkable quick and slow twitch reflexes for his build. Please read his trip reports as they are a great collection of memories and pictures that help people appreciate what is out there to be explored. There's even some great hikes with friends over the past year that are funny and touching at the same time! 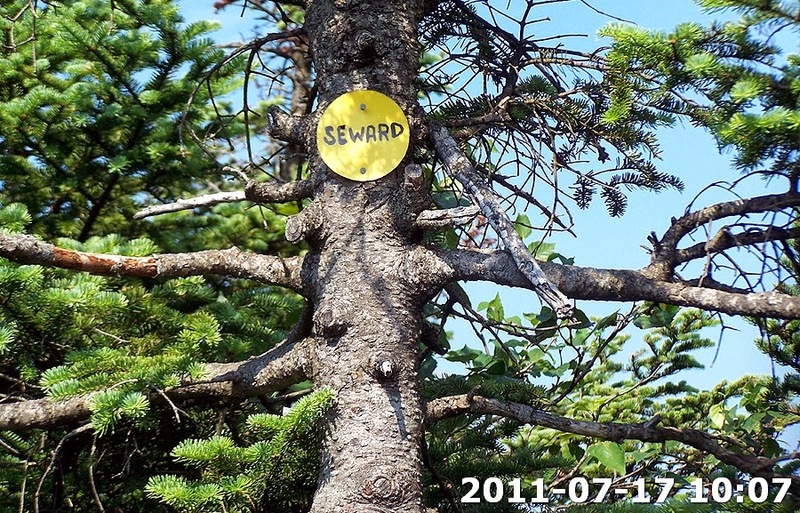 I hiked up the herd path to Marshall with Chris back in June of 2011, well part of the way until he took off. No way he is making these times up, the guy is freakishly fast and still takes excellent pictures to boot. Joe, please leave him alone with respect to what his blog is about. Jeff, your son or your sons friend lead us back to the trail that day IIRC. I still owe you all a beer for that! Congrats on your finish! Sorry to hear that you and your friend's niece hike slow. If they must do this route, I suggest bringing a head lamp and as they'll likely finish in the dark. Chris, pay no attention to this guy. Keep hiking fast and taking your great pictures. Chris just say the following next time you have a doubter, "I'll see you at the trail, anytime, anywhere!" Thanks, I really should have just ignored him instead of wasting my time defending my abilities. Did the seward range last Thursday ( 7/31/14) with a friend. Started at 8:00 and finished at 5:25. Got rained on for 2 hours. I saw that Chris did the Great Range in 9:27. That's an awesome time. I bet he could the Seward Range in under 8 hours on a cool day! Great articles Chris. U made my hike easier to follow . When I saw u did it in 9:25 I knew I could do it in one day. People shouldn't doubt your times they should just work harder on theor own! Hi Tom! Glad you liked my trip report, much appreciated :) Sounds like you guys had a great hike, I'm hoping to get back out there this fall and maybe in the winter! As for the comments in this thread, usually I ignore comments that are meant to provoke on this blog or on hiking forums. I don't like being called a liar and I felt I needed to defend myself. Chris, thanks for the great trip report. Super handy. I think Joe was just pointing out that this is a pretty big day to do all in four peaks. Of course everyone always needs take into account their own hiking pace for the distance + elevation but most folks shouldn't expect to show up and knock them all off in 9.5 hours. For an additional point of reference it took my son and I 13.5 hours (we did take a couple of longish breaks) and another party that we met said they had done them all a few weeks prior in 14.75 hours.